Every so often you will hear from the media about the risks of Salmonella from pet turtles. Sometimes, the news sounds dire and scary, but the risk of Salmonella infection is not new and it can be avoided. Salmonella has been around longer than there have been pet turtles so it isn't a new thing. It is, however, a fact that many types of animals, including pet turtles, can carry the bacteria and transmit it to humans. The ban on selling hatchling turtles in the US was enacted back in 1975, largely in response to infections of Salmonella in children from pet turtles (which were small enough to fit in their mouths), which were widely available back then. The risk is real and should be taken seriously, but the fact that we have known that turtles can carry Salmonella for years gives some perspective. Remember that many people have lived with pet turtles for years and have never had any problems. If you are a healthy individual and live with other healthy people then your concern level with pet turtles and contracting Salmonella from them should be minimal. Turtles have been given undue attention when it comes to the issue of Salmonella since they are not the only animals that can carry the bacteria. Unless testing is done on each individual pet, it is prudent to assume that any reptile or amphibians can carry Salmonella since it is considered a normal part of their bacterial flora. Salmonella can also be carried by many other species including cats, dogs, rodents, and other pets. An outbreak of Salmonella infections in hedgehogs occurred in 2013 and involved several states and over two dozen people. Salmonella can also cause infections from sources other than pets. About one million foodborne Salmonella infections are caused each year by tainted food. Many serotypes of the bacteria exist and many sources cause human illnesses each year. Diarrhea, abdominal cramping, and fever are the most common symptoms and will occur within three days of infection. These symptoms typically last up to a week but severe cases, especially in immune-compromised individuals, can cause death. While it typically isn't anything to panic about, the risk of Salmonella should be taken seriously, especially if you have young children or people with compromised immune systems in your household. In these members of the family, Salmonella infections can be very serious (The Centers for Disease Control and Prevention recommend not keeping reptiles at all in households with at-risk individuals). For most households and families, following good hygiene practices (like careful handling and regular hand-washing) will greatly reduce the risk of infections in humans. Avoiding hand to mouth contact is always a good thing as well when handling any animal. Regular cleaning of the enclosure is another key way to reduce your risk of contracting Salmonella. Waste material and other debris can harbor the bacteria, leading to an increased chance of you or a family member contracting an infection. In recent years, the concept of Salmonella-free turtles was introduced, where Salmonella bacteria are eradicated from turtle eggs, resulting in Salmonella-free hatchlings. Studies have shown that in some cases, previously Salmonella-free turtles may eventually test positive for Salmonella, possibly when turtles become reinfected through the environment or from contact with turtles that are not free of the bacteria. Therefore, it may be possible to produce Salmonella-free turtles but there is no guarantee that they will stay that way. 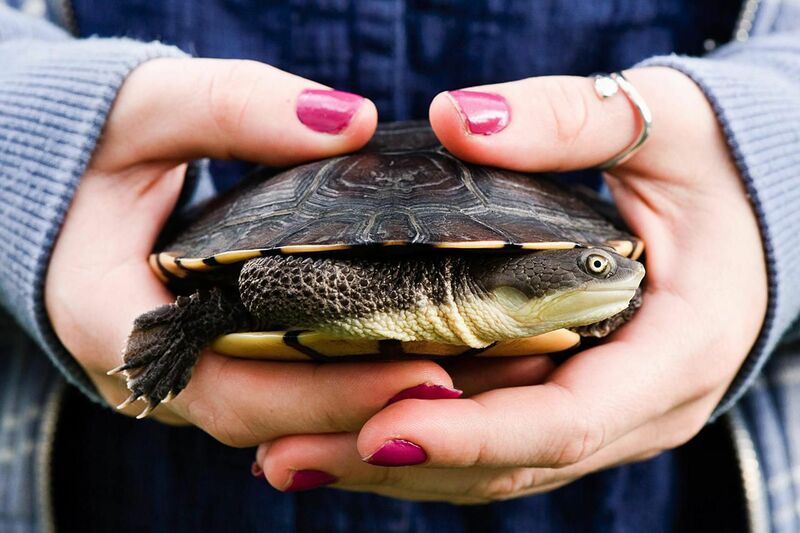 The idea of buying Salmonella-free turtles might give owners a false sense of security. Without the worry of the bacteria, owners would be less careful about hygiene, thinking they no longer have any risk of contracting Salmonella. What Are Salmonella-Free Turtles? Are They a Good Option?